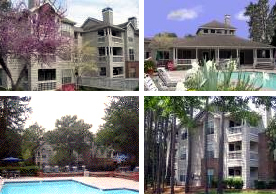 1 & 2 Bedrooms, 1 & 2 Bathroom apartments for rent Some floor plans have dining rooms and storage areas off decks. Parking lot. Large pets welcome with some breed restrictions. 150 lbs max, some fees/deposits required. 86 North, 200 Westminster Drive, Chapel Hill, North Carolina 27514.